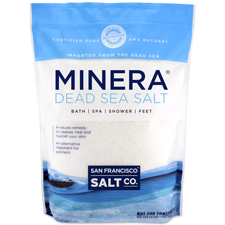 Many clinical research studies have been carried out to establish the therapeutic properties of Dead Sea salts. Below are excerpts from some of these. Abstract Magnesium salts, the prevalent minerals in Dead Sea water, are known to exhibit favorable effects in inflammatory diseases. We examined the efficacy of bathing atopic subjects in a salt rich in magnesium chloride from deep layers of the Dead Sea. Volunteers with atopic dry skin submerged one forearm for 15 min in a bath solution containing 5% Dead Sea salt. The second arm was submerged in tap water as a control. Before the study and at weeks 1-6, trans-epidermal water loss (TEWL), skin hydration, skin roughness, and skin redness were determined. We found one subgroup with a normal and one subgroup with an elevated TEWL before the study. Bathing in the Dead Sea salt solution significantly improved skin barrier function compared with the tap water-treated control forearm in the subgroup with elevated basal TEWL. Skin hydration was enhanced on the forearm treated with the Dead Sea salt in each group, which means the treatment moisturized the skin. Skin roughness and redness of the skin as a marker for inflammation were significantly reduced after bathing in the salt solution. This demonstrates that bathing in the salt solution was well tolerated, improved skin barrier function, enhanced stratum corneum hydration, and reduced skin roughness and inflammation. We suggest that the favorable effects of bathing in the Dead Sea salt solution are most likely related to the high magnesium content. Magnesium salts are known to bind water, influence epidermal proliferation and differentiation, and enhance permeability barrier repair. Dermatology Unit, Kaplan Medical Center, Rechovot, Israel. Matz H, Orion E, Wolf R.
Balneotherapy and spa therapy emerged as an important treatment modality in the 1800s, first in Europe and then in the United States. Balneotherapy involves immersion of the patient in mineral water baths or pools. Today, water therapy is being practiced in many countries. Examples of unique and special places for balneotherapy are the Dead Sea in Israel, the Kangal hot spring in Turkey, and the Blue Lagoon in Iceland. Bathing in water with a high salt concentration is safe, effective, and pleasant for healing and recovery. This approach needs no chemicals or potentially harmful drugs. There are almost no side effects during and after treatment, and there is a very low risk to the patient's general health and well-being. Mineral waters and muds are commonly used for the treatment of various dermatologic conditions. The major dermatologic diseases that are frequently treated by balneotherapy with a high rate of success are psoriasis and atopic dermatitis. The mechanisms by which broad spectrums of diseases are alleviated by spa therapy have not been fully elucidated. They probably incorporate chemical, thermal, mechanical, and immunomodulatory effects. The major importance of balneotherapy and spa therapy both individually and as complements to other therapies lies in their potential effectiveness after standard medical treatments have failed to give comfort to these patients. 2. Baths with a 2% salt concentration. 3. Baths with a 0.50% salt concentration. One week of proper treatment: resulted in impressive improvement in all parameters in patients receiving 7.5% and 2% bath salt concentration, but little or no improvement was noted in those treated with 0.5% salt concentrations. The greater the physical limitations, the more pronounced was the improvement. Sixty-six patients received two weeks treatment. An additional, slight improvement was noted in patients treated with 7.5%. or 2% salt concentration, and those having only 0.5% salt baths improved relatively more as compared with the results after the first week of treatment. However most of the results in the 0.5% group were less impressive than those in the higher concentrations. Over 80% of all the patients reported having less pain, 70% said their mobility improved, and about 60% were able to decrease their use of analgesics. Dr. Machtey concludes his study by stating that ? There is little doubt that the Dead Sea treatment in those who benefit from it can be extended and repeated at home using a 2% bath solution, which is both economical and readily available?. The study was performed with 60 patients whose rheumatic discomfort could not be substantially reduced by the customary balneotherapy of their clinic. The baths with Dead Sea Salts were then prescribed in lieu of additional medicinal therapy. Each patient was treated for a duration of 4 weeks, with three baths per week. Salt concentration was 2.5%, duration of bath 20 minutes, temperature of water 37 °C. Parameters examined included: Pain at rest, spontaneous pain, kinesalgia, pain on pressure and reduced mobility. A summary of the results shows that in 76.2% of the cases, very good therapeutic results were obtained, 10.2% responded moderately well and only 13.6% no success was noted. This was a study of the effect of Dead Sea Bath Salts on patients suffering from psoriasis. Fifty patients, aged between 14 and 77 years were treated with the salts in a controlled way. Treatment consisted of partial or total baths. For a total bath, 2 kgs (4.5lbs) of the salts were dissolved in a bath at a temperature of 27°C. The partial baths were made with a concentration of about 10%. The baths lasted for 20 minutes and afterwards the skin was thoroughly rinsed with running water. The effect is enhanced when the patient remains in a warm packed condition for one hour after the bath. The treatment lasted for 3 weeks, with 3-4 baths per week. The results show that most symptoms of the illness diminished within one week of treatment, notably itch, scaling joint complaints, and the falling asleep and sleep through difficulties. Other parameters such as spread, redness and infiltration decreased somewhat more slowly. Improvement was steady - the four week treatment left the patients essentially free from complaints. Dr. Arndt points out that of particular importance from the patient's point of view is the rapid relief from such irritating a symptom as itching. There is a corresponding relief from sleeping disturbances, which were rather wide-spread prior to treatment. The drastic decrease in scaling within one week can be interpreted by physician and patient alike as a further proof of the course outlined above: Healing was total in 27 patients (54%), whereas in 22 cases there was a marked impressive improvement. Tolerance was excellent in all 50 cases. There were no side effects whatsoever, dermatological or otherwise.